great Design! Also great texturing, and painting. I really like the plump shape of the shark, very unusual. Great! Great !! such a col texture. You can feel the cold weight of this beast. top ! A shark eating angler fish doesn't make any sense. I'm new to this site having signed up yesterday. If I want to use you wonderful drawing for non-commercial use, how do i do that? Hi! Would it be possible to see this before the Photoshop? those black eye's, like a dogs eye's....he doesn't seem to be living...until he bites ya. There's always a bigger fish. That's what I thought (from the quote from Star Wars...) and wrote it before I saw your comment! yeah. i could`ve sworn i saw that shark in "Finding Nemo" (C) pixar! Shark Week is truly amazing, I've caught every episode of it since last Sunday! Anyways, I love how you've drawn this shark, and the attention to detail you've put on the slight separations between the body and the fins and the little notches in the fins as well I especially love the teeth and that eye is very captivating for some reason. All in all, great work and Happy Shark Week to you! This is wonderful! That shark is a beauty, and I love how you drew the shark. Cool art indeed! Awesome - love the colors and the patterns on the shark - you have a unique style! 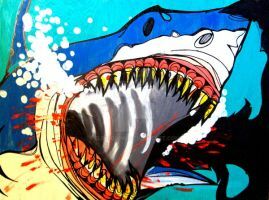 Jaws ;] still with a wish to have my logo edited by You ;] edited by one person so far ;] have a nice day ! Which reminds me of Jaws 3. I.ve actually necer seen imaginism on DA before, wow. this is such a pretty picture, very cute and beautiful and amazing. Definitely one of my favourite things on Deviant art.